As the end credits rolled following the first episode of Line of Duty's second series I sat in front of the screen open-mouthed. Because my job is to watch a lot of television, I'm rarely surprised by any of the twists that TV dramas offer. That wasn't the case with Line of Duty as I don't believe anybody foresaw the death of Jessica Raine's Georgia Trotman before we witnessed her being thrown from that hospital window. I believe that part of the reason for that shock is that writer Jed Mercucio went to great lengths to flesh out the character of Georgia. 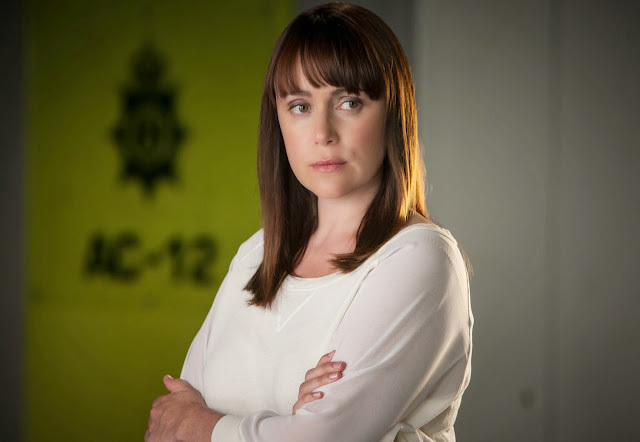 Trotman had been drafted into AC-12 to fill the void left by Kate Fleming (Vicky McClure) who'd turned down the opportunity to work on the team's latest case. Right from the off Georgia was presented as the classic rookie cop as Steve Arnott (Martin Compston) questioned whether she was up to the job. Indeed, she struggled with certain aspects of the job and criticised the way her superiors went about their investigation. However, any sense of Georgia's innocence was later taken away in scenes which presented her as a heavy drinker and someone who had a particularly addictive personality. The fact that a possible romance between she and Steve was teased made you believe that there was a lot more to come for the character. With all of these prospective stories for Georgia the last thing you expected was for her to be killed off so soon. But then Line of Duty has never been a series that has played by the book and the introduction of Keeley Hawes' DI Lindsay Denton. After being the only surviving police officer of a brutal roadside ambush, Denton is questioned as a witness by AC-12. Certain aspects of her story, namely the route their police convoy took, doesn't add up in the eyes of the team. But whereas series one's main suspect Tony Gates was a highly-respected detective with a happy family, Lindsay appears to be the complete opposite. Even before she took two unarmed officers into a life-threatening situation, Lindsay wasn't exactly popular with her colleagues. Denton had previously made complaints about two of her fellow officers who she believed to be corrupt. Her home life isn't any happier as she lives in a small house she hates with only a cat for company. But Mercurio makes you doubt the character for several reasons, not least because she keeps removing her whiplash neck brace. In addition, there's the altercation she has with her nuisance neighbour plus that phone call that she makes to the hospital just before Georgia's death. Though I do feel that this series can be watched without any prior knowledge of the events of the first, we are given the idea that all of the characters have progressed somewhat in the last year. Steve is certainly more confident in his role and becomes sort of a mentor to Georgia during her brief time at AC-12. Steve's certainly the most member of the team as both Ted (Adrian Dunbar) and Kate appear to be concealing secrets. Kate's secrets involve her extramarital affair with Richard Akers, the husband of Jane Akers, one of the officers killed in the opening ambush. While it's unclear how long the affair has been carrying on for we learn that Jane and Kate have known each other since they trained together. Because she is so close to Richard, Kate declines Ted's offer to take the case, but later reconsiders after learning that Jane tried to contact her on the night of her death. I personally don't think we've ever seen the real Kate Fleming throughout Line of Duty and the fact that we learn of this affair just strengthens this argument. With Kate later implanting herself as Lindsay's new DC, it's clear that she's back to what she's best at namely gaining people's trust while undercover. Meanwhile Ted's issues concern the strained relationships he has with his wife Roisin, as they seem to have separated, a fact that Ted conceals when the couple go for dinner with Steve and Georgia. One of Line of Duty's many plus points is the way it punctuates some of the episode's more shocking moments with engorssing dialogue-heavy scenes. I was firmly involved in the action from the graphic opening scenes as we saw two of the ambushed party escaping from their car, covered in flames. Similarly shocking was the scene in which Lindsay's colleagues shove her head down the toilet following her return to work. Even though I've seen this scene three times, it's impact is still as strong as it first was and I found it incredibly bleak. At the same time Mercurio makes sure the story comes first and we are presented with an interrogation scene that last well over ten minutes. The main AC-12 story is split up with a few little subplots that are incredibly intriguing as I've got no idea where they'll lead. For example the investigation of the event as a whole is dealt with by DCC Dryden (Mark Bonnar) who along with PR consultant Jo (Liz White) attempt to appease the press with a number of soundbites. The relationship between the police and the media is an interesting area to tackle and, judging by the few scenes that involved these characters, it's an area that Mercucio has researched well. Lindsay's new missing persons team is another fascinating side story that does appear to be relevant to the main plot in some respects. The fact that Lindsay went to interview the foster-parents of a missing teenager suggests that this isn't just a throwaway tale and more will be made of this throughout the course of the series. Line of Duty series one relied on a strong ensemble of actors and I'm pleased to report that series two carries on this tradition. Keeley Hawes is at her best here playing completely against type. Hawes has dressed down and wears barely any make-up in order to make her performance as Denton truly believable. 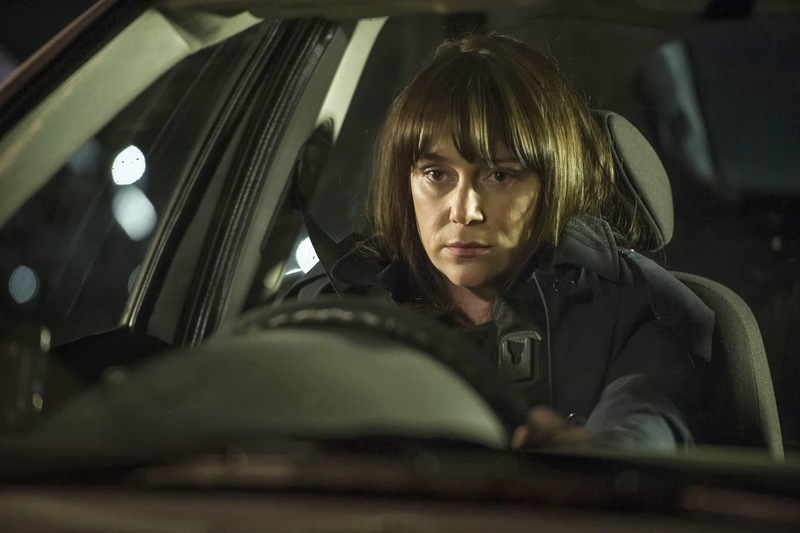 Hawes' portrayal of Lindsay adds to the ambiguity of the character as at some points she acts incredibly timid while at others, most notably the incident with the neighbour, she gets incredibly angry. Martin Compston and Vicky McClure improve on the performances they gave last series with the latter being especially impressive as the enigmatic Kate. I'm glad that Adrian Dunbar has had the chance to flesh out Ted Hastings and I'm really looking forward to seeing what direction his character takes. Finally it was great to see Jessica Raine in a contemporary drama and I found her performance as Georgia to be one of episode one's highlights. It's just a shame that we won't get to see more of her after that shocking final scene. It's fair to say that this year has failed to yield a truly great TV drama, with even Sherlock disappointing in some respects. Luckily, Line of Duty has changed all that and has combined edge-of-your-seat thrills with a realistic central storyline. Mercucio's script is well-paced with the shocking scenes held together well by a lot of important character development. With the possible exception of Steve, all of Mercucio's characters are intriguing and I really want to find out what their true loyalties lie. 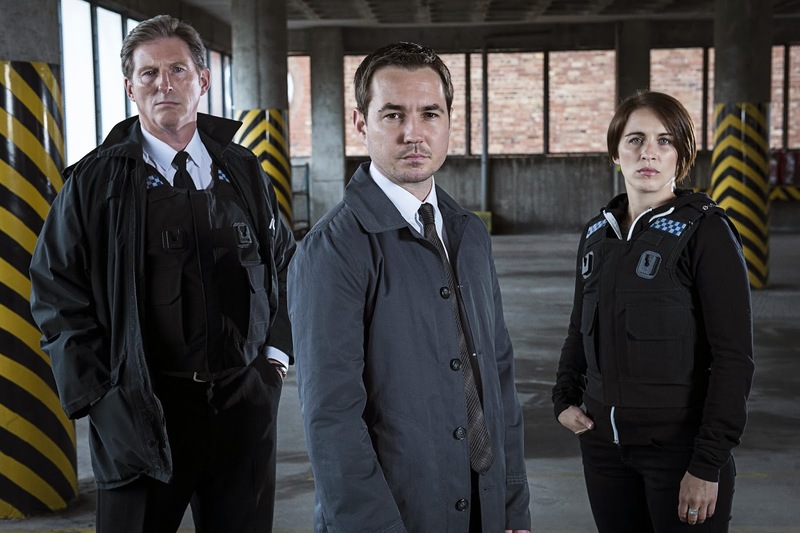 I've just got my fingers crossed that the rest of this series of Line of Duty is as brilliant as this first episode and I really can't wait to see what happens next. Line of Duty Continues Wednesday's at 9.00pm on BBC TWO. But yes, the opening episode of Line of Duty was excellent.